Playwright Ken Ludwig’s Lend Me A Tenor has been a favorite of community theatre since its original Broadway production closed some 20 years ago. It’s light, funny and set in 1930s Middle America (Cleveland to be exact). Its operatic subject matter may give it a sheen of highbrow snob appeal, but most of the time Ludwig aims for big, lowbrow laughs. Tito Merelli (Anthony LaPaglia), a flamboyant Italian divo, arrives in Cleveland, Ohio to sing a benefit performance of Verdi’s Otello with the local opera. He’s not feeling well, and, through a series of blunders, he takes too many sleeping pills and can’t be roused in time for the performance. 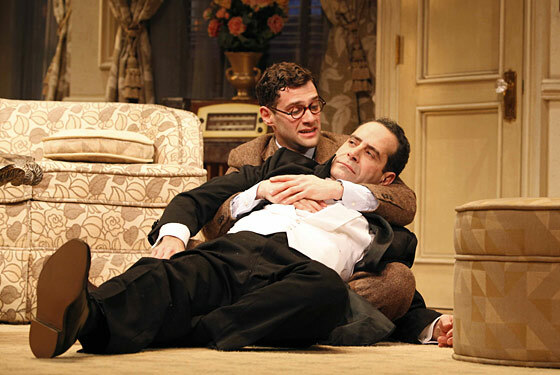 Local impresario Saunders (Tony Shaloub) conspires with his ambitious assistant Max (Justin Bartha) to cover for Tito’s absence. This is farce, so chaos reigns supreme by Act II. Stanley Tucci, making his Broadway directorial debut, has put together a very game and fun-loving cast who are plainly having a great time hamming this silliness up. Tony Shaloub may be having just a little too much fun, as he has a tendency here to milk his comic moments, getting laughs for himself, sure, but slowing down the frantic pace that is the soul of successful farce. On the other hand, Jan Maxwell, as Merelli’s hot-headed wife Maria, shows us all how it’s done, going way over the top as she zooms through the long-suffering woman’s jealous hysteria. Justin Bartha does a fine job as the good hearted guy caught in the middle. Max is the sentimental center of the play, and Bartha plays even his goofiest moments with great charm and warmth. LaPaglia plays Merelli with a raffish charisma, lending credence to both his philandering and his generosity.